Climate Change-Ready Rice Keeps Farmers' Fields Fertile : Goats and Soda Climate change has made some soil in Bangladesh more salty, so many farmers have had to leave fields fallow. But what if there were rice varieties that could naturally tolerate the salty conditions? This is the result of salty soil. Sometimes it's so hard to coax rice into growing in the soil that farmers leave fields fallow. 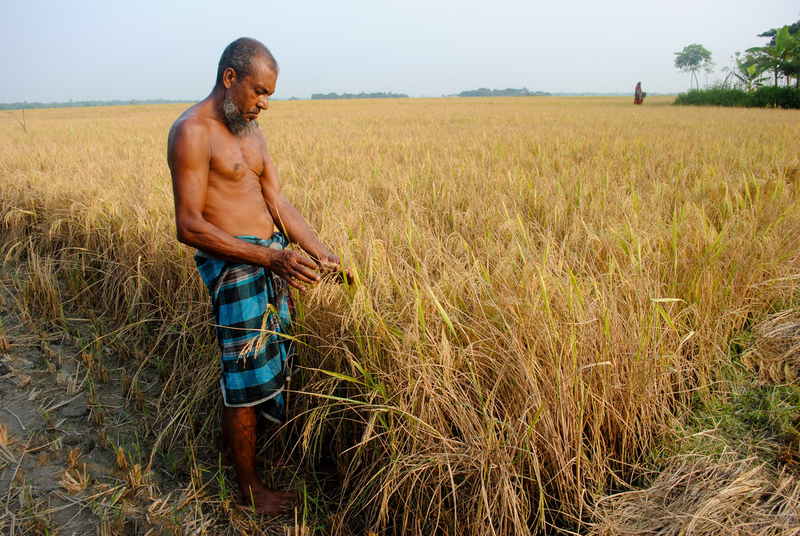 Climate change is one reason farmland in Bangladesh is becoming increasingly saline. This is especially the case in the coastal south, which was traditionally the country's rice basket. Across the country, hundreds of thousands of acres of land lay fallow. Production of rice and other salt-sensitive crops, such as potato and mustard, has decreased. "A lot of land is fallow because of salinity," said Timothy Russell, head of the Cereal Systems Initiative for South Asia, or CSISA, in Bangladesh. Russell says there's a potential fix for the problem: Plant a variety of rice that's naturally resistant to salty soil. "If you can bring in salt-tolerant rice or other salt-tolerant crops, like sunflower, you can utilize the land," Russell says. "That's the dream." And it's slowly becoming a reality. Since 2011, about 180,000 farmers have received saline-tolerant rice seeds and training on how to grow them. It's part of a program sponsored by three nonprofits: the International Rice Research Institute, the World Fish Center and the International Maize and Wheat Improvement Center. Bangladesh is the world's sixth-largest rice producer. Rice accounts for 70 percent of calories consumed by its population of 160 million. Agriculture that can withstand climatic threats is especially important in Bangladesh. The country is a low-lying river delta and thus is vulnerable to floods and violent storms. It is also one of the world's most densely populated countries: Imagine more than half the U.S. population crammed into an area the size of Iowa. Scientists at the Bangladesh Rice Research Institute created the new varieties by crossbreeding rice varieties that were already naturally resistant to salty soil. So they're not genetically modified plants. Heat Tolerant, Tough Teeth, Lots Of Milk — They're Supergoats! "The first adopters of new varieties and crops will be the wealthier farmers who can afford to take risks," Russell says. "Less wealthy farmers will watch and wait. If the experiment works out well, they will follow." But it's risky for farmers to rely just on shrimp farming, says Mohammed Harunur Rashid, a scientist with the Bangladesh Rice Research Institute. Disease can wipe out a whole farm. So the salt-resistant rice allows some farmers to alternate between cultivating shrimp and growing rice. Din Mohammed, a 42-year-old farmer, estimated his rice yield dropped by a third because of increased salinity after Cyclone Aila in 2009. The storm broke near river embankments and flooded the village's precious farmland with salty water. But the new variety yields more rice, he says.